David Slater, managing director of Spaces Sheffield, is heavily involved in the regeneration of Attercliffe. Here he writes about the changing fortunes of the area. Attercliffe is mentioned in the Domesday Book. It's about to enjoy an amazing renaissance. In 2012, along with many others from the public and private sectors, I attended a lecture called 'Europe’s Greenest City' hosted by Sheffield Hallam University and presented by Prof Wulf Daseking, head of urban planning in Freiburg, Southern Germany. Prof Daseking repeated his key messages several times - that Sheffield is a city too focused on its centre and must consider sustainable developments across the whole of the city; that development should be focused along the tram routes that run into the suburbs, and that walking and cycling should be encouraged to have priority over the car; that 'elephants' - namely huge inner city centre developments - are not the way forward and city centres should be about people and spaces; and that the idea of a strong, independent mayor who can drive development is far better suited to leading a city than our current party political system. I am pleased to say it appears that maybe - just maybe - the tide is turning in Sheffield and at last the city is beginning to get its act together to become a city of European significance. The story in the city centre has been well documented and is now creating its own momentum. Sheffield East is perhaps not getting the publicity it deserves but I am witnessing a transformation to behold and it's important that word gets out. Sheffield East is fast becoming a place where people want to be. Businesses, retail, sport, leisure and government organisations are establishing themselves along the Attercliffe corridor from junction 34 of the M1 at Meadowhall to the Wicker and the city centre. Here is a very quick snapshot of what you can see in the Sheffield East gateway today: Meadowhall, IKEA, Meadowhall Business Park, the retail park, Centertainment, FlyDSA Arena, IceSheffield, Don Valley Bowl, South Yorkshire Police's headquarters, the EIS, the UTC and the Olympic Legacy Park. In Attercliffe, hotels, new bars, shops and businesses are all opening up and thriving, and with a bit of luck the public domain and landscaping is at last being given consideration. Virgin Media, Gripple, Sumo Digital, architects, tech companies, accountants and lawyers are settling in Sheffield East too. I often talk about Attercliffe being a Hollywood movie star with teeth missing - everyone looks at the gaps in the teeth. Well, those gaps are now being filled in and the results are great. The future for Attercliffe is very exciting. 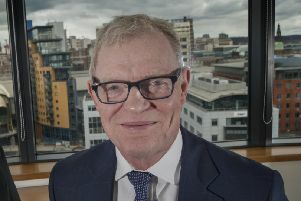 The Olympic Legacy Park, championed by Richard Caborn and backed by the Advanced Manufacturing Park, the universities and Sheffield Council is an absolute game changer. Don't take my word for it - go and take a look and you will be astounded at the progress. The UTC and Oasis Academy are now established places of learning and next year they will be joined by research centres and, more importantly, students. Hallam University is already well established in Attercliffe at Woodbourn Road and now it is investing in the OLP and surrounding areas. Don't be surprised to see more activity from Hallam in the months and years ahead. Sheffield Children's Hospital's research centre and a food engineering centre are being built now. Amazingly, the centre of Attercliffe is suddenly becoming prime real estate with the news that at last housing is on the agenda for the district. There is the potential for more than 1,000 homes, and developers and housebuilders are in the area looking for opportunities. People are actually warming to the idea that Sheffield East is a place where they can enjoy an amazing lifestyle. You just have to walk into the old library and take a look at what Aaron Stewart has done to cater for the new clientele working in the district. It's not difficult to see why Attercliffe is set to become a success story - after all, it was the east end of Sheffield that put us on the map in the last century or two. Walk from Meadowhall to the Wicker along the river or canal, catch the tram or the regular X1 bus, or jog, cycle or drive. It's easy. There is loads of open space, lots to do, plenty to see and an awful lot of amazing architecture both old and new. The Attercliffe urban village is ready to fly. Living on the edge - the Cliffe edge - is the future.